It started as a prediction from a DeKalb County School District (DCSD) child two years ago. It turned into an impetus for hard work, discipline, and passion for music. It ended—on May 3—as a fantastic reality for Martin Luther King Jr. High School’s marching band. 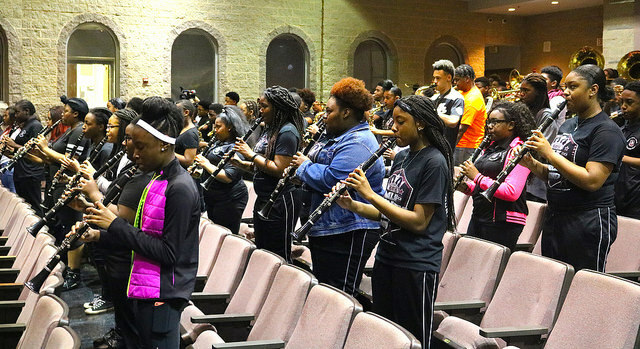 Martin Luther King Jr. High School’s marching band—The Kings of Halftime—was selected as one of nine bands nationwide to march in the 2019 Macy’s Thanksgiving Day Parade. For the next 18 months, the band will raise funds, spread enthusiasm, and continue to perfect its craft, before marching in front of more than 50 million people across the globe. 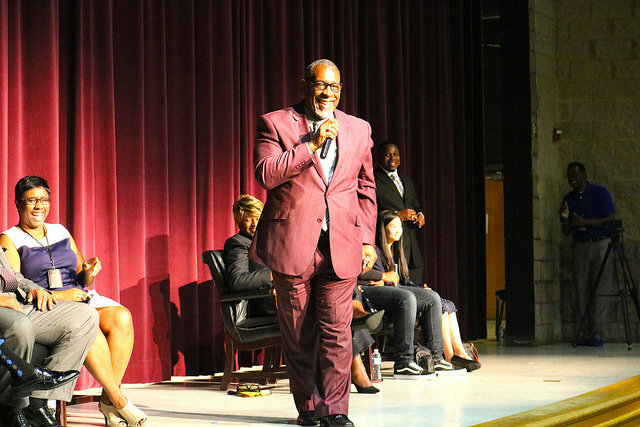 DCSD administrators joined MLK high school and Macy’s officials on May 3 for a surprise announcement at the school. Students gathered into the auditorium in the morning and thought they would be practicing. Instead, they were greeted by Macy’s Parade & Entertainment creative director Wesley Whatley, who did a great job creating anticipation. Whatley, who marched in a high school band as both a saxophone player and drum major, will travel throughout the country to invite other bands to play in the 2019 Thanksgiving Day Parade. According to Whatley, more than 100 high school, college and adult-level bands. DCSD Superintendent/CEO R. Stephen Green, who played the tuba in high school, was among the first to congratulate the Kings of Halftime on their invitation. Green was joined by DeKalb County Board of Education member Vickie Turner, regional superintendent Triscilla Weaver, and MLK High School principal Ennis Harvey in expressing congratulations. Martin Luther King Jr. High School’s marching band has played at such locations as California for the annual Rose Parade, South Africa, Dallas, Alabama, among others.